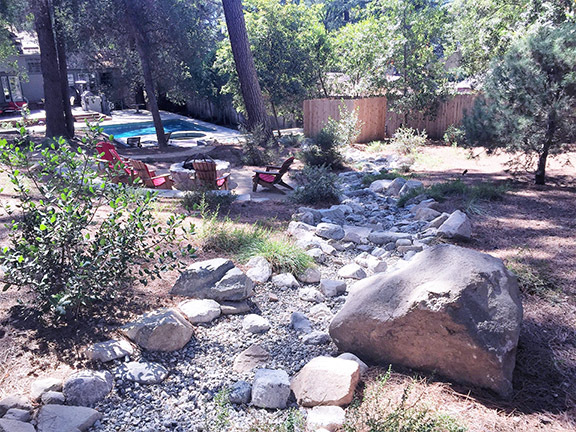 Welcome to Plant Goddess Landscaping, a design-build landscaping firm located in Sierra Madre, California. Servicing the San Gabriel Valley for over 15 years, we are dedicated to creating beautiful, sustainable landscapes for homeowners, businesses and cities, using less water. Whatever your goals are for your outdoor space, Plant Goddess is there to help you achieve them. If you need a landscape design, our design team works with you to create a master plan that can be implemented all at once, or in stages. We design features such as patios, decks, pergolas, outdoor kitchens, water features, walkways, river beds, rain gardens, seating areas, and play areas. Our planting plans range from California native gardens, succulent gardens, Mediterranean gardens, and edible gardens, or a mix of different styles. We no longer install grass lawns, but we are experts at removing them and coming up with low water alternatives. In addition, we design highly efficient irrigation systems and can retro-fit existing irrigation systems to be more efficient. We also offer landscape lighting plans using low voltage LED lighting. If you are just looking for someone to consult with about your landscape, we offer consulting services by the hour, or we can perform a complete landscape evaluation. These evaluations include a formal report on the irrigation system, any drainage issues, soil and plant health, and general tips for things that can be done to improve an existing landscape. Kelley Hanna, the owner of Plant Goddess, has 2 certifications from prominent organizations in the landscape industry and has taught many homeowner classes for cities and water districts. Class topics include California Native Gardens, Efficient Irrigation Practices, and Dry Lush Gardening for Drought Stricken Areas. We can also customize a class on request. Plant Goddess Landscaping carries a C27 Contractors License and is fully insured. Our crew takes pride in installing high quality landscapes with attention to detail. In addition to installing our own designs, we are also happy to bid projects designed by other firms.